Gene tried to play the saxophone when he was a youngster. He finally gave up and turned successfully to the guitar. Interested in buying Gene Autry accessories for your computer, refrigerator, or wardrobe? Well friends, you've come to the right place! Everything from Gene Autry mouse pads to flashlights, key chains to fridge magnets, and hats to shirts can be found here. To purchase a copy of these items and more, please visit the Museum's Online Store. This lapel pin commemorates the Angels' Opening Day 1999 and honors Gene Autry's love of baseball. 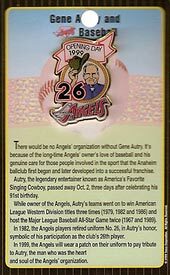 In 1999, the Angels baseball players wore this patch on their uniforms to pay tribute to Gene Autry, the man who was the heart and soul of the Angels’ organization. 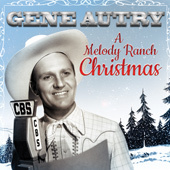 Gene Autry A Melody Ranch Christmas is a special album with a vintage radio show approach. 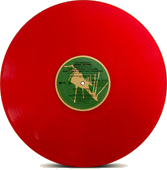 Originally released in 1957, this fondly remembered Gene Autry album features "America's Favorite Singing Cowboy" performing his classic Christmas songs. If there is a season, there is a song for it. 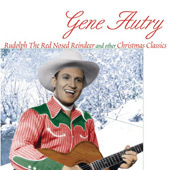 Gene Autry is well known for his best-selling classic Christmas songs and this new album is his first-ever CD of songs for the entire year. 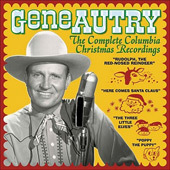 For the very first time, all of Gene Autry’s original Columbia Records Christmas songs are available on one CD, digitally remastered for the highest quality and best listening experience. 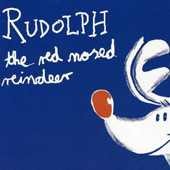 Rudolph, the Red-Nosed Reindeer is one of the most familiar songs in all American music, and among the Top 20 all-time earners in the American record business. 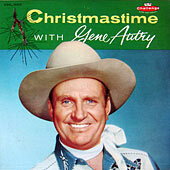 Your favorite Christmas songs by your favorite cowboy, Gene Autry, are a must for your holiday soundtrack. 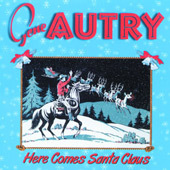 Gene Autry recorded new versions of his greatest Christmas songs in the 1950s and ’60s and for the first time ever they are together on one CD, Here Comes Santa Claus. 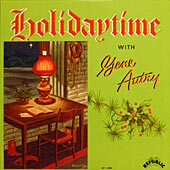 A Gene Autry Christmas is a delightful compilation of Gene Autry’s original 1940s and ’50s Christmas recordings for Columbia Records. As the Christmas season approaches our thoughts turn more frequently to remembering the life and teaching of the One whose birth we celebrate on this day. These Christmas songs come from the heart of a man who has a deep feeling for the spirit and warmth of this holiday which means so much to all of us, as we feel that CHRISTMASTIME with GENE AUTRY will help his friends everywhere enjoy the real spirit of Christmas. 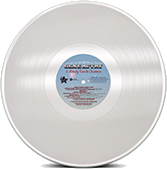 For the first time ever, Hal Leonard presents a collection of 25 Gene Autry Christmas classics. 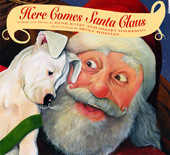 Holiday favorites like "Here Comes Santa Claus (Right Down Santa Claus Lane)," "Rudolph, the Red-Nosed Reindeer," and "Frosty the Snow Man" along with rare out of print and hard to find treasures "Santa's Coming in a Whirlybird," "Nine Little Reindeer" and "The Night Before Christmas, In Texas That Is" are now available in one complete songbook. 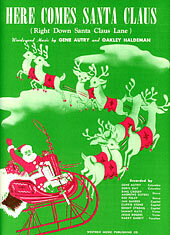 This collection includes individual sheet music of six Christmas songs. 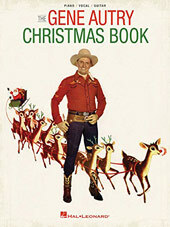 This song book, with the charming Gene Autry Christmas cover illustration by Chuck Saxton, was released by Gene Autry’s Western Music Publishing Co. in 1954. New this year, Gene Autry Entertainment and the Autry Museum of the American West are pleased to present the limited edition Gene Autry Star Ornament designed and created by artist Tandy Wilson. The 2002 Gene Autry ornament is Gene and Champion riding along and roping. 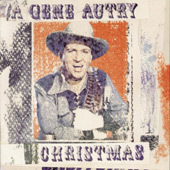 The 2001 Gene Autry ornament is Gene's hat, Martin D-45 guitar, and Bluebird boots surrounded by music notes. 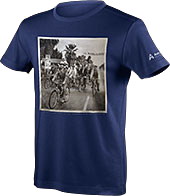 Exclusive to the Autry Museum Store! Celebrate your favorite Singing Cowboy and your favorite flying reindeer with this Gene Autry and Rudolph T-shirt. 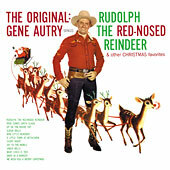 The shirt is available in men's, women's and children's sizes and features the cover of Gene Autry's 1957 LP release The Original: Gene Autry Sings Rudolph the Red-Nosed Reindeer & Other Christmas Favorites. Take our favorite "Christmas Cowboy" with you everywhere you go! Seasonless and timeless, this unique handbag is made from an authentic Gene Autry Christmas record album, Holidaytime. 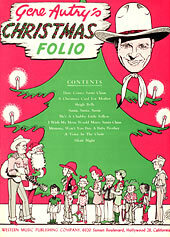 From the moment Gene Autry co-wrote and recorded Here Comes Santa Claus in 1947, the song has served as a Christmas classic for children and the young-at-heart. 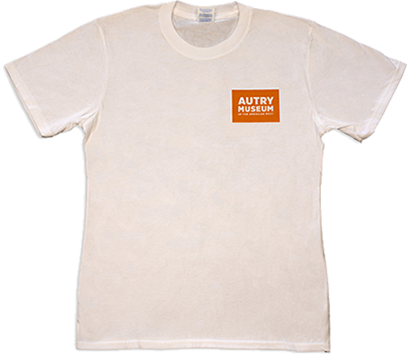 New for 2018, the Autry Museum Store presents a children's t-shirt with Gene Autry's famous Bluebird Boots. The Autry Museum of the American West is celebrating its 30th anniversary this year. 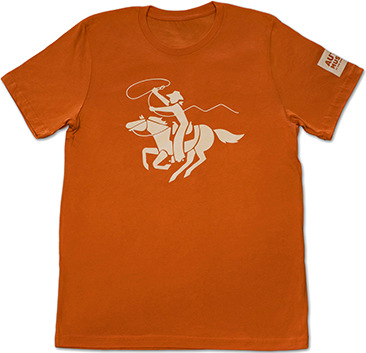 The Autry Museum Store is marking this special event with a retro t-shirt featuring the museum's original "Horse and Rider" logo on the front and current logo on the left sleeve. In celebration of the Autry National Center's Silver Jubilee/25th Anniversary, these limited-edition Autry Anniversary Boots are handcrafted in the USA by Back at the Ranch in Santa Fe, New Mexico. What happens when the Autry Museum Store folks find a bunch of cool Gene Autry Republic Records Inc. The Autry Museum of the American West is commemorating Gene's military service with a special museum case titled "The Cowboy Is a Patriot: Gene Autry in World War II." Gene Autry is known for riding his famous horse Champion, but in 1962 he swapped his saddle for a Schwinn and rode down the streets of Palm Springs with his baseball team, the Los Angeles Angels. 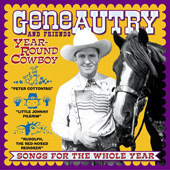 Are you a Gene Autry fan? Then you need to show it with our latest t-shirt from the Autry Museum Store. 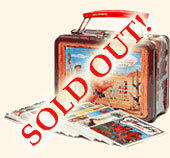 Exclusive to the Autry Museum Store! Celebrate your favorite Singing Cowboy and your favorite flying reindeer with this Gene Autry and Rudolph T-shirt. 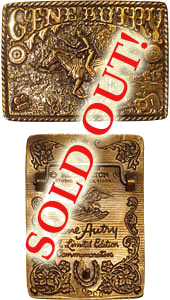 In 1979, Gene Autry commissioned artist and sculptor Al Shelton to make 200 limited edition bronze belt buckles commemorating Gene Autry’s movie career. In celebration of the Autry Museum's 25th anniversary, Gene Autry Entertainment and the Autry Museum have created three limited-edition scarves featuring original Gene Autry movie poster art from the 1930s, '40s and '50s. Dress your junior buckaroo in this chocolate brown and rust chap and vest set and set him off on an adventure. Made in the U.S.A. of 100% suede cowhide leather. Gene Autry's Cowboy Code, sometimes referred to as the Cowboy Commandments, is a code of conduct to live by. Famous tailor, Rodeo Ben, designed an exquisite shirt for Gene Autry in the 1940s which is now in the Museum's permanent collection. These silk scarves were reproduced with the exact image of a 1940s child's scarf featuring Gene with his guitar in a western scene. The new USPS Cowboys of the Silver Screen stamp set features a colorful, movie poster inspired image of America's Favorite Singing Cowboy, Gene Autry. Gene Autry's favorite boots were his Bluebird Boots. In fact, when he gave his originals to the Museum, he missed them so much that he had Rocketbuster make him a new pair. These custom-made leather boots from Rocketbuster were inspired by a Gene Autry shirt in the Museum's collection and produced during our exhibition How the West Was Worn. This Scully shirt is inspired by Gene Autry's Bluebird boots, which are now in the Autry National Center's permanent collection. This Scully shirt is inspired by one of Gene Autry's most popular shirts from the 1950s, which is now in the Autry National Center's permanent collection. This Scully shirt is inspired by the playing-card motif Gene Autry used on his cowboy boots throughout his entertainment career. 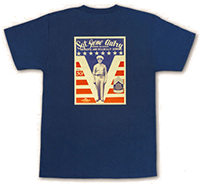 This Scully shirt is inspired by one of Gene Autry's most popular shirts from the 1930s and 1940s, which is now in the Autry National Center's permanent collection. This Scully shirt is inspired by one of Gene Autry's beautifully embroidered personal appearance shirts from the 1940s and 1950s, which are now in the Autry National Center's permanent collection. 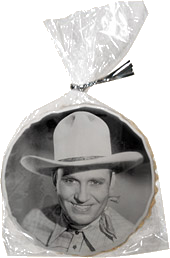 Now through the magic of modern frosting technology, you can have a tasty sugar cookie with a photo of Gene Autry on it! The Autry partners with Gene Autry Entertainment and Zona Rosa Coffee to bring you this commemorative smooth, rich, and full-bodied House Blend Coffee featuring beloved films by museum founder Gene Autry: Mexicali Rose, South of the Border, and Down Mexico Way. Collect all three! Fully embroidered oval patch features the logo of Gene Autry's Flying A Pictures. Tan background with brown letters and border. 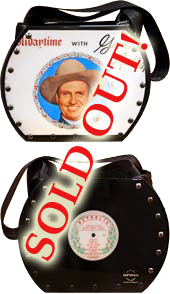 The Gene Autry Alarm Clock is sure to be a hit with kids and collector's alike. During the planning of the museum, Gene Autry posed for sculptor De L'Esprie for a larger than life statue in the museum's main plaza. Gene Autry Limited Edition Comic Trading Cards set comes attractively packaged in a mini metal lunchbox with images of Gene Autry and Champion on both sides. "America's Favorite Cowboy" Limited edition collectible plate depicting Gene, Smiley Burnette and Champ by Nostalgia Collectibles. This 1950s-era Gene Autry magnet, in his very cool horse shirt, will look swell on your refrigerator or office filing cabinet. 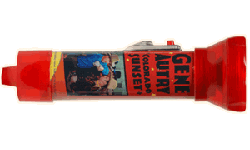 Send your friends secret messages with your handy, battery operated, Gene Autry tin flashlight. 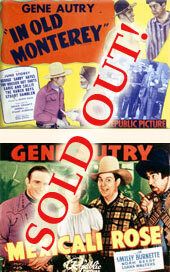 The movie posters and lobby cards from Gene Autry’s Republic Pictures films were colorful works of art that you can now proudly display on your refrigerator or filing cabinet with the Gene Autry Magnet Set. These magnificent magnets are available individually or as a set. Go roamin' round the cyber range with America's Favorite Singing Cowboy protecting your mouse. 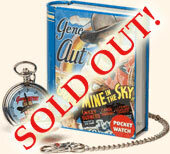 The Gene Autry Pocket Watch with its exciting design makes a trusted companion for children and adults alike. Every time you reach for this 12-inch ruler you'll relive those great days at the movies! Enjoy the colorful lobby cards and black and white movie stills from Gene Autry's Republic Pictures films Mexicali Rose, South of the Border, Down Mexico Way, and In Old Monterey. Have you always wanted a singing cowboy in your corner? Add a hero to your home or office, apply the finishing touch to your Western-themed party, or complete your Gene Autry collection with this life-size standee of America's Favorite Singing Cowboy. 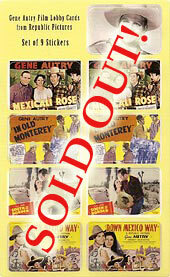 Set of nine stickers features lobby cards from Gene Autry's Republic Pictures films Mexicali Rose, South of the Border, Down Mexico Way, and In Old Monterey. 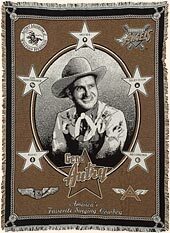 Wrap yourself up in all things Gene Autry with this beautiful throw blanket. 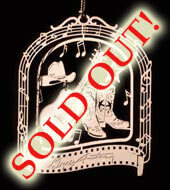 The design features America’s Favorite Singing Cowboy surrounded by images of his career including all five of his stars from the Hollywood Walk of Fame, the original logo of the Gene Autry Western Heritage Museum, the Angels baseball logo, pilot’s wings, and the Flying A Pictures brand. Gene's signature featured across his famous Martin D-45 guitar. Bright red enamel on gold tone. 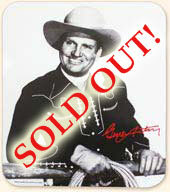 Gene Autry Entertainment is excited to announce the debut of "Gene Autry's Cowboy Code" greeting cards! 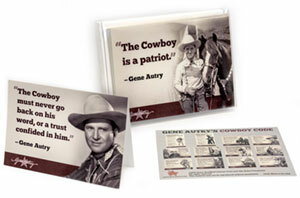 Since the late 1940s Gene Autry fans have lived by these tenets that promote an ethical, moral, and patriotic lifestyle and today you can share them with these handsome cards. Make someone's day a little brighter with a handwritten note on a Gene Autry note card or just say "Howdy!" on a Gene Autry post card. 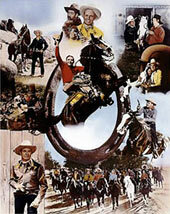 "Gene Autry, America's Favorite Cowboy"
This full color poster is a classic collage of scenes from Gene's feature films. Unframed. The color poster "The Stars of Columbia Pictures" bears the original signatures of 18 of Columbia Studios' greatest western stars. This poster is sure to become a collectable! 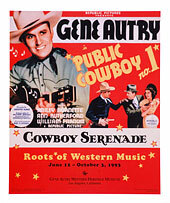 Originally created in 1993 for the special museum exhibition Cowboy Serenade: Roots of Western Music, this poster features the Autry National Center's original name and logo. 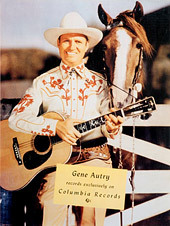 This color poster of Gene Autry and Champion was used for miscellaneous promotional purposes, including promoting his Columbia Records recordings. 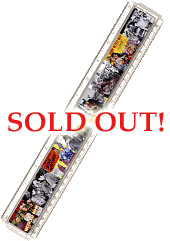 "The Last of the Singing Cowboys"
This illustrated poster titled "The Last of the Singing Cowboys" features images of the five famous matinee idols: Gene Autry, Monte Hale, Eddie Dean, Roy Rogers, and Rex Allen. 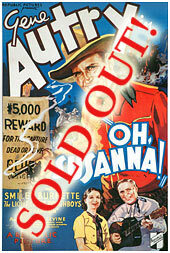 Enjoy the details of this large reproduction movie poster promoting Republic Pictures' 1936 Gene Autry film Oh, Susanna! Wind up this reproduction tin toy, set on a flat surface, push down lightly on the front to activate, and let go! 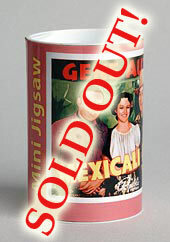 Mini Jigsaw Puzzle: "Mexicali Rose"
Have fun putting together this mini puzzle of the lobby card from the 1939 Gene Autry film, Mexicali Rose. 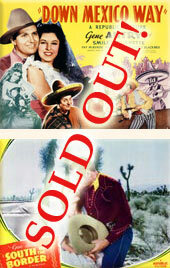 Mini Jigsaw Puzzle: "South of the Border"
Have fun putting together this mini puzzle of the lobby card from the 1939 Gene Autry film, South of the Border. 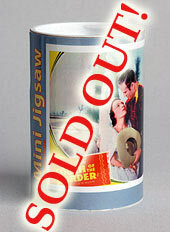 The Autry Museum owns a wonderful collection of ephemera from the golden years of silver and small screen cowboys. These paper doll books were reproduced from books in that collection. The Cowboy Legends Toy Holster Set is an exact reproduction of the toy holster sets made by the John R. Craighead Company in the 1940s and 1950s. 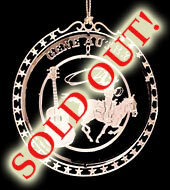 Jefferson Manufacturing made the official, licensed Gene Autry cowboy guitar in the 1950s and now they're at it again.